1. Heat the oil in a large frying pan and cook the onion, peppers, celery and chorizo for 5 minutes until the vegetables have softened. 2. Meanwhile, heat the rice in a microwave according to the packet instructions. 3. Stir the prawns, tomatoes and spice mix into the pan and cook for 2 minutes. Add the warm rice and continue to stir-fry for a further 2 minutes until the prawns are cooked through and the jambalaya is piping hot. Stir through the parsley and serve. 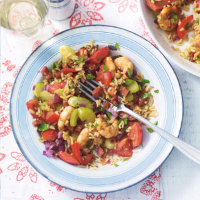 The word 'jambalaya' comes from the Provençal word meaning 'mix up' - so why not try varying the ingredients you add to your rice.